Make this beautiful, yet simple salad for your family and friends. 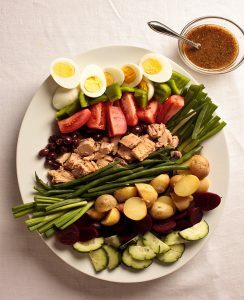 It’s so easy (uses canned tuna), healthful, and so interesting, it can also be your centerpiece. You don’t have to stick with this exact recipe – add any vegetables you like to eat raw with salad dressing, such as zucchini, asparagus, celery, or carrots. In a medium bowl, whisk together lemon juice, herbs, salt, pepper, and mustard. Continue to whisk while slowly pouring in the olive oil. Store in refrigerator until time to serve salad or up to 3 weeks. Arrange all salad ingredients on a large platter. Just before serving, drizzle on Dressing. Serve extra Herb Dressing on the side.